Black Lillies frontman Cruz Contreras has already flirted with national fame a few years ago with a hit (“Man Over”) on Country Music Television and an appearance on “Late Night With Conan O’Brien” in 2003. Now he’s found a new voice and calling with The Black Lillies. Already, as an independent artist, the band kicked off their first national tour at the Ryman Auditorium, the hallowed mother church of country music, and have since labored through three cross-country treks, with a fourth underway this summer. 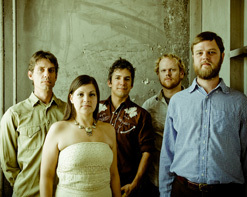 They’ve performed onNational Public Radio’s “Mountain Stage” and on two episodes of PBS’s “Jammin’ at Hippie Jack’s,” and they’ve conquered numerous festivals – Pickathon, the Americana Music Association Festival, Four Corners Folk Festival, Bristol Rhythm and Roots, even Bonnaroo. And in June 2011, the show that made country music famous – The Grand Ole Opry – invited the band to make their debut on the historic circle of wood where so many other legends have performed. The Black Lillies are the first independent artist to have done this! The band has also recently picked up an Independent Music Award for Best Album, Americana for their album Whiskey Angel. “Two Hearts Down” is the latest single from the band’s new record titled 100 Miles of Wreckage, which has quickly gained national attention and already hit #11 on the Americana radio charts. “Two Hearts Down” was directed by acclaimed video director David McClister (Lady Antebellum, Leann Rimes, Dierks Bentley) and shines as an example of outstanding camera work. The clip features the band performing in a wooden tavern lit entirely by lanterns. The story behind the track is played out by dancers dressed in Día de los Muertos-style outfits and with skeleton masks painted on their faces. Eventually the tale comes to a tragic end as the tavern catches fire, in gorgeously shot cinematic mastery. The song sounds as good as it looks, laced with a driving banjo, violins, tapping, and, of course, some seriously beefy Fender lead guitars. The Black Lillies are currently hard at tour behind their new record, so catch them while you still can. Just let us know if you’d like to attend a show or get to interview this rapidly rising group. “Two Hearts Down” easily appeals to a wider range of listeners than just Americana and country fans, as the band keeps their hooks in mind at all times, and with a video this pretty, it’s darn hard to look away with no good excuse. We are thrilled to be part of this exciting campaign and hope you give it the attention it so rightfully deserves. Let us know if you like a copy of 100 Miles of Wreckage for yourself or any contest needs. For more info, call Andy Gesner at 732-613-1779 or e-mail us at HIPVideo@aol.com. You can also visitwww.AttackMonkey.net or www.TheBlackLillies.com to find out more about The Black Lillies and tour dates near you.